As an East Coaster, I’ve always dreaded winter. But when my ski- and snowboard-loving husband and I moved to Colorado this past year—a state known for some of the best ski resorts in the world—I decided it was time to give winter a fair shot. Skiing seemed like one way to have fun and burn some calories so I signed up for a Women’s Program at a local resort. My expectations were pretty low. I’d skied once before and the experience left me a little fearful and my first day of lessons was no different. I had a hard time and just felt out of control. If I hadn’t paid for the 6-week program up front, I probably wouldn’t have gone back. But I did go back, and that’s when things clicked. I’m still skiing—and improving. If you want to learn how to ski, take proper lessons. (Having a family member or significant other teach you may end in an argument!) Pretty much any ski resort will offer private (one-on-one) or group lessons. Group lessons usually include ten or fewer students and are great if you are learning with friends or do better a group setting. If you feel pressured or intimidated by others, a private lesson may be the way to go. Wearing proper clothing can make the difference between a good day and a bad day on the slopes. For your outer layers choose a waterproof jacket and snow pants that have ventilation for when your body temperature rises. Add a fleece, which you can remove if you start to get hot. Finally, wear a base layer under. I like wearing a wool shirt that keeps me warm and wicks away moisture and capri pants that won’t get bunched up in the top of my boots. Wear gloves (or mittens) with a removable liner so you can adjust your temperature. If it’s windy or cold out, you might want to wear a neck warmer that can fold up to cover your face—it can get very cold on the chair lifts! Also, purchase a pair of ski socks, which provide extra support in areas where your boots apply pressure and also wick away moisture. Having a helmet on will help protect your head from a possible injury—it’s better to be safe than sorry! 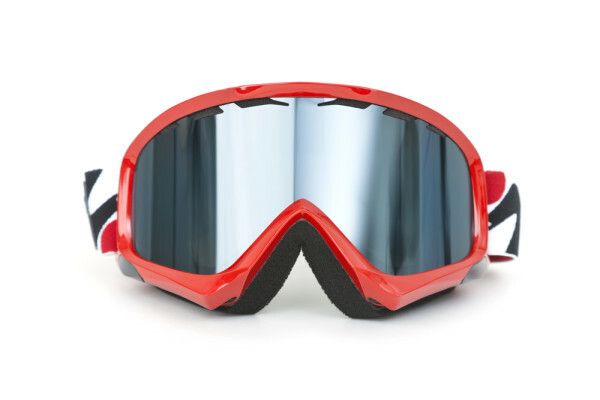 Goggles are also a necessity: Make sure that you choose a pair that fits with your helmet properly and doesn’t block your peripheral vision. 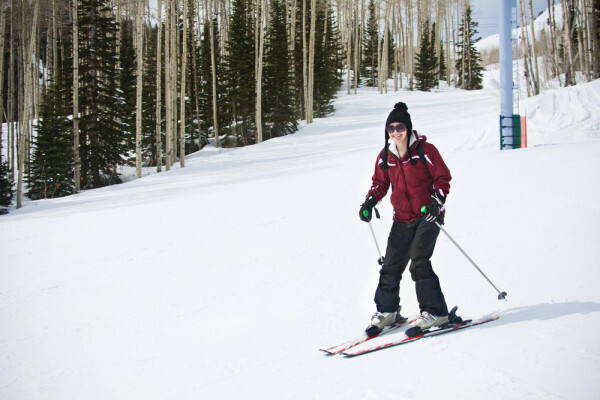 Boots, skis, and poles can be rented at any ski mountain; many beginner packages include rental fees. Apply sunscreen on your face in the morning and throughout the day—the sunlight reflected off the snow can lead to a nasty sunburn. Keep tissues and lip balm (preferably with SPF protection) and use as needed. 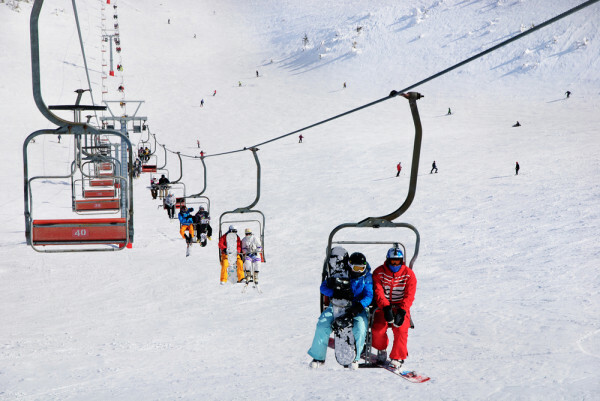 A common skiing fear is about riding on the chairlift. Some move incredibly fast and it can take a few attempts to load and unload properly. 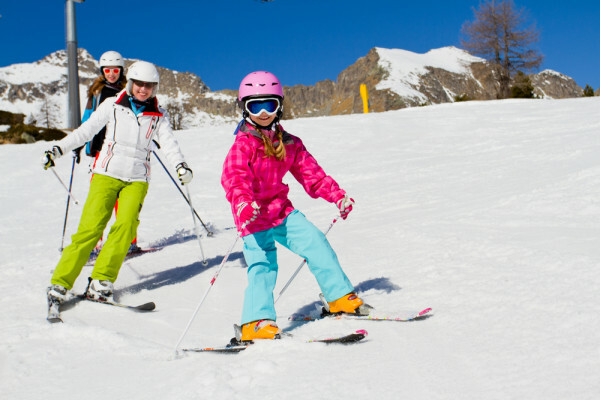 Standing up and skiing straight ahead will get you off most chairlifts safely. My first (and most helpful) piece of advice for your first attempt at skiing is don’t be afraid to fall. I fell at least ten times during my first lesson. Once I fell the first time, I realized that it wasn’t a big deal and I could just get right up and try again. Stopping is probably the most valuable skill that you will learn—and once you master that, you can do anything. Your teacher may show you how to turn your skis perpendicular to the slope or to do the “pizza technique“. 9 Ways to Burn Calories- Just by Playing in the Snow!